Providing a fast and secure way to ​allow​ users to identify themselves using different identification options and their mobile device. Registered mail is an indispensable asset for parcel services and recipients. The availability of tracked and insured postal delivery that allows the sender proof of mailing via receipt or electronic verification is essential for businesses as well as private ​users​. Currently though, the process of unambiguously identifying the person accepting and signing for a parcel leaves much to be desired – both in terms of security and convenience. A physical identity check by the delivery agent is very time-consuming and therefore expensive and relies on a human individual to thoroughly and correctly carry out a proof of identity. At the same time, the risk of fraud increases since it is very hard and expensive for eCommerce shops and parcel services to enforce definite identification based on a signature sample. This leads to fewer and fewer parcels being sent as registered mail as well as higher costs and poor customer experience when shipments are wrongly claimed by others or the recipient illegitimately claims to not have received a parcel. 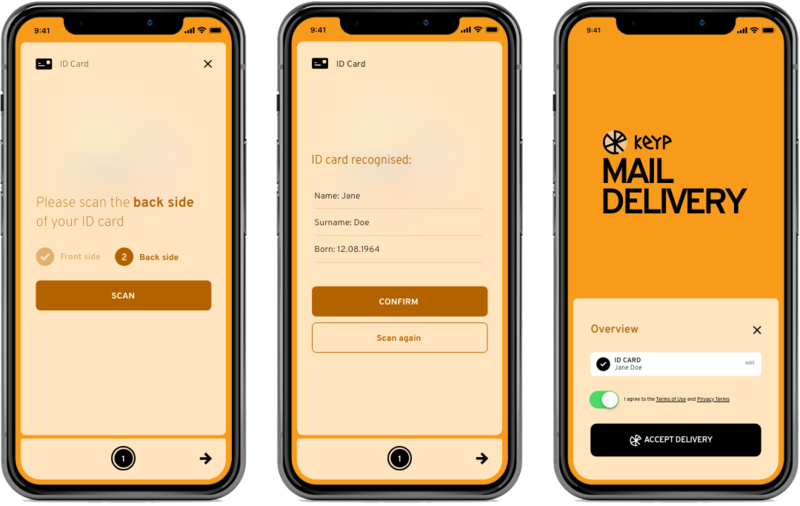 The ​Keyp Identity Terminal​ provides a fast and secure way to ​allow​ users to identify themselves, for example, to delivery personnel, using different identification options and their mobile device. When accepting registered mail, users can now simply scan the QR code on the package with the app and consent to providing their verified ID, which is already available in the ​Keyp Wallet.​ For biometric authentication users swipe the screen of their smartphone or carry out a face recognition process. The applied methods can either be set by the eCommerce shop or can be based on the value of the delivery. Should users allow their neighbors to receive a parcel on their behalf, they can proceed the same way. After identification a peer-to-peer notification is triggered to inform users which neighbor received the delivery at what exact address. Users, eCommerce shops and logistics companies can now safely determine who accepted a delivery to improve convenience and simplicity as well as reduce fraud. After the first identification process through the ​Keyp Wallet​ app the submitted credentials can be reused for future deliveries. Parcel services can safely identify their customers without having to implement additional technology – Users obtain a convenient and safe method to identify to delivery staff. This way, identity-based delivery with ​Keyp​ benefits both users and businesses​ – anywhere, anytime.